It’s a color-coded family system when it comes to the children of Sharon Harris and Sonia Brown. Sharon, 35, and Sonia, 40, are sisters of mixed racial descent. The fathers of their children are both white. The children are a combination of races. Sharon has two daughters, nine and seven. One is white and one is black, coloration-wise. Sonia has two twin boys, age five. One is white and one is black. 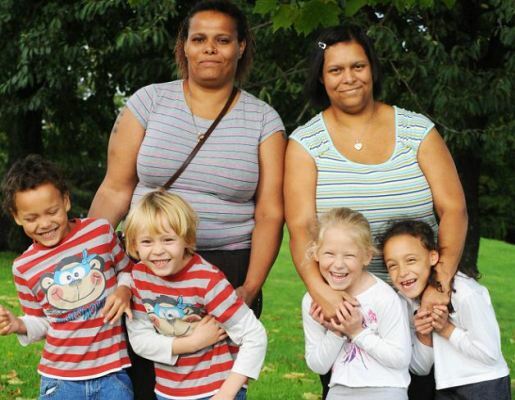 The two sisters have a child of a different race, despite both kids having the same fathers! They’re far from identical, but apparently the genetic division is more common than I thought among multi-racial families. Still, it’s pretty unusual circumstances, but if the family unit is functional, then good for them!